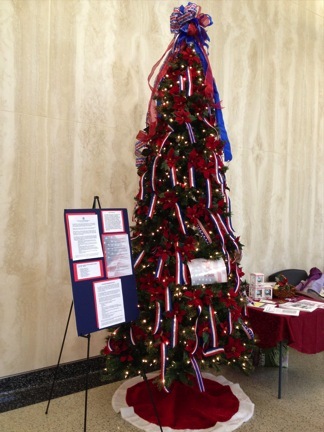 Oakleaf Benevolence hosts the annual Tree of Honor during the month of December in the lobby of the America Building at Walter Reed Bethesda. At the Tree of Honor, Oakleaf Benevolence invites people to honor a service member, individual or group by placing a red, white, and blue ribbon, including the name of the honoree, on an evergreen tree. The names hang on the tree the entire month of December and are then published in the January Oakleaf Newsletter. In exchange for the ribbon, we suggest a small donation to our Benevolence Fund.